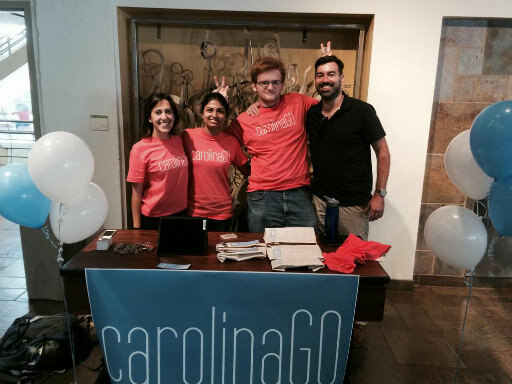 Matt Leming, a senior majoring in computer science, is part of a team that created the University’s CarolinaGO mobile app, which officially launched October 28. 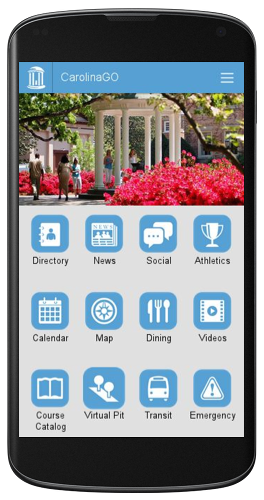 Originally an initiative pushed by the student body president, the m.unc.edu mobile app project was several years in the making, involving persistent and talented student developers, collaboration with Carolina administrators, assistance from mobile app frameworks vendor Modo Labs, and support and guidance from ITS leaders and team members. Who is involved on the project? The core team now really consists of me, Nikita Shamdasani and Diana Dayal. Daniel Pshock was deeply involved for a long while, but he decided to opt out after he graduated. There has been a large number of students who have come and gone on this project. A lot of them were involved because it seemed savvy, but they ended up leaving when they learned how boring making mobile apps could be. Others really did put a lot of work into this project, even though that work may have not made it into the final product … Today, there are a number of IT workers and administrators in on this project as well (Billy Hylton and Miles Fink, the folks at Modo Labs, the upper IT administrators). What is the ultimate goal for the mobile app? The purpose is to bring all relevant information needed to live at UNC into one’s mobile device, and for students to be actively involved in that project long after we graduate. That second one is our hopeful, ultimate goal — for this project to continue to be University supported and student led. I think the main turn in developing of this app has been shifts in the vision of it — between sparking innovation and long-term sustainability. At first, we wanted something that was totally custom-built. Every line of code had to be written by students. Then we realized that that wouldn’t work for having an app that would still be there even five years from now — so, the vision shifted from that to getting a company’s framework that we could build on and customize. ITS became interested when we started to talk like that, and they realized that they could work with students who were giving real thought to the long-term. Describe the process for bringing the mobile app to fruition? It has gone by as quickly as it could have. If you told me during the first half of my sophomore year that I would have to wait till my senior year before this thing would be released, I probably would have been baffled. It sounds slow when you say it like that. But hurdles come up and bureaucracies are difficult to navigate. There were several instances in this project in which we could have released a lesser product … but we favored patience. Compromise is necessary. Students and administrators don’t always see eye-to-eye on a project like this, and we have to be aware of each others’ needs and worries. How has your work with ITS affected your hands-on experience? It’s familiarized me with the process of long-term technical projects, which I think has been invaluable. Being a clever coder and problem solver aren’t nearly as important as communicating with other team members. Most problems get solved with a bit of persistence, I’ve learned, but things get really befuddled and lagging when you’re not being clear and communicative. What made you decide to go into computer science? The most attractive thing about it is that computer science is a mix of art and math. I was an art student in high school, but I also liked subjects like calculus and chemistry. When I took my first computer science course at UNC, it seemed to combine those disciplines. I was creating something while mathematically solving a problem at the same time. The employment prospects don’t hurt, either. How do friends and family respond to your ingenuity? Well, I’m really nothing special in the tech world. People innovate every day at UNC-Chapel Hill and in the tech world at large. What students these days are doing on those fronts is amazing, so I’m struggling to tag along with everyone else. The ingenuity of the mobile app isn’t so much in the technology as it is in the relationship between students and administrators in pushing this thing forward. People make mobile apps every day, but it is not so often that students get real control over a creation that gets adopted by such a large institution. The administrators are taking a risk in investing in us, but giving students creative control keeps everything fresh. If you want to inquire about a student-employee job at ITS, contact ITS at its_communications@unc.edu.